Jamon Whitehead attempted the 100-mile True Grit on a townie bike. True Grit is billed as Long, Tough, and Technical and has never failed to deliver. 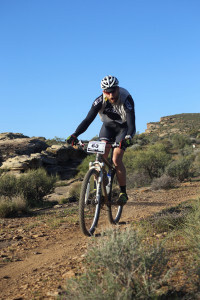 To win True Grit takes amazing physical conditioning, excellent bike handling skills, a keen pacing strategy, a spot on hydration and nutrition plan, and a little luck to have a mechanical free race. However, with 380 registered participants and a 30 % drop out rate, not everyone is in it for the win. Wikipedia describes the characteristic of having Grit as “perseverance and passion for long-term goals, with a powerful motivation to achieve their respective objective.” Other sources define Grit as moxie, perseverance, fortitude, gumption, determination, firmness of spirit or unyielding courage in the face of hardship or danger. For many people it takes all they have to just finish this race; or to just push on until they can go no further. This year, in addition to the rugged course and warm spring desert sun, Mother Nature dished out a strong steady wind, with gusts exceeding 40 mph. The dry warm air was a welcome, if not stark change to the frigid temperatures seen around the nation this winter. At the end of the race I was struck by all the amazing stories of individual pursuits of a personal goal. Three stories stuck out to me, the first of a participant from New York, who used True Grit to lose weight and get sober. The second of an accomplished racer who decided to take on the 100-mile race with an extra challenge; complete on a Townie Bike. And the third, of two brothers, who just wanted to share an adventure of a lifetime. We bring you these inspirational stories from racers, in their own words… that showed GRIT. The first story is by Randy Shoogs Larrison, who traveled to southern Utah from Long Island NY. This one had my attention. Long before the end of the season and SSCXWC, long before I stopped drinking and started eating clean, it was ominous, looming there on the horizon. I knew it would prove to be a hard one. Looking back to 2013, I was recovering from yet another surgery to replace the broken Ti plate on my collarbone that was installed just 51 weeks earlier. I had several racing setbacks and I began to not care about results and just had fun. I still loved riding my bike; I just wasn’t exactly focused on performance. I started more than one National Ultra-Endurance Series race working off the drinks from the day before. I treated those races as weekends away with the boys with a race mixed in. Even so, I did fairly well, considering it all. True Grit 100 would represent a step up from the normal NUEs we've done. Travel alone would be huge, flying with bikes etc… With a hard cutoff at 11 hours, the fear of failure was the driving force in making some abrupt changes. I had decided to live it up until SSCXWC, and then flip the switch. The following Tuesday I weighed myself and set the course to lose 20 pounds while training for this one. I started at the gym for about a month, found my 12 week mark from True Grit and started a canned ‘bike only' training plan. That first week on the plan was not kind; I realized in short order that it was not sustainable for me. I needed more help, and got a coach instead. Perhaps if I wasn't in such a state of disrepair I'd have stuck with the canned plan, who knows but that's not what happened. Once I got onboard, I was all in. I got directions, followed them and gave my feedback. The frigid cold on the East coast this winter made training a little tougher. Despite it all, I lost the weight, and a touch ahead of schedule, might I add. I was stoked that I was heading into the race following the plan, and had done my part and lost the weight. My buddy Jeff and I left on Wednesday evening on a nonstop from JFK to Las Vegas. I'd been to this part of the country before and knew what was in store for us. I tried to let Jeff know that whatever he had in his head, the reality would be SO much better. Two short hour to our hotel with a stop to take pictures along the way. We immediately started building bikes as pre-riding was a must! Zen was the first day, and while it was overcast it was spectacular. It was everything I had hoped for – epic trail in a different land. We hadn't seen dirt in forever and now we were on some dirt, and a bunch of rock, in a desert. Lining up at the start I noticed two things, one there wasn’t a ton of ‘average guys’; and at 6’2” and 175 I was the fat guy. Holy hell, shaved legs, muscles rippling, minimal body fat and me. I wasn’t racing them, but while cyber stalking for details on the race I wondered ‘didn’t any regular Joe’s do this frickin’ race?’ All that meant was that I’d be working alone at points, which is OK.
On the Jeep road leading out, they started moving… away from me…at a pretty good pace…the road went up and they didn’t pause. Later boys! Then, I began noticing something I hadn’t earlier in the day, wind. A strong wind and we were heading into it. Decisions to hold wheels came and went and we were heading into barrel trail, which we’d be doing twice. It was surreal pedaling up the mini canyons. They were spectacular visually. I was pretty happy with how I was moving. Then Gerry Pflugg, the Singlespeed 100 winner that day, was a freight train that passed me at the bottom of one of the fingers. Cheryl Sornson, female champ, was to follow nose over the stem, looking strong and grinding. Sonya Looney caught me going up some techie climb where I had to loft the front wheel, stall and loft the wheel again to complete the up. She called out ‘I saw that, you rode it’ I was afraid I held her up. This was right before this ‘death drop’ techy multi-level descent that I was not going to be riding. I rode Zen enjoying the views as I went along. It was just so damn cool seeing the completely different scenery. I loved it. After Zen I hit the bag drop and start a climb to the fun section. The wind was still blowing. The fun, Bear-Claw Poppy section was a full on high-speed pump track on white earth hard as concrete and bumpy as hell. It was fast flowy and fun until it was over, and then there was no fun to be found. The next 6 miles on, at best a false flat, at worst a climb into a stiff headwind. It was so windy the tops of my bottles where whistling. So windy I stalled going down the backside of a roller. It lasted forever. I can’t describe how windy it was. There was no escaping it; I was always into the wind, by myself. Yuck. AND, I’d have to do it twice. I went into a dark place, only thoughts of Rim Rock and Barrel Roll pulled me out. I climbed up the switchbacks and the wind was brutal, into the wind was a climb, with the wind a descent. I rolled up to the 50/100 split and started lap 2. The exposed climbs blowing sideways meant I had to focus to stay on the singletrack, no mental rest. For some reason I thought the cutoff was 2:00 at this aid station. I got there at 2:45 and was happy to be able to go out again. No Zen this time, straight up the hill and heading into the fun stuff before hell. I was told the next cutoff was 4:30 and wondered if I’d make it. It took so much out of me mentally. I had no power in my legs and the wind was in my head. The dark place I was before was nothing compared to where I was on the second loop. I hadn't given up, and wasn't going to let doubts creep in. I looked off into the distant often, remembering that my wife was back home and I didn't want to come back without a finish. I saw two people on the end of that brutal section, before the road turned towards Rim Roc, simply chatting with them lifted my spirits enough to push a bit more. When I pulled into the checkpoint my Garmin beeped. It was 4:30 on the nose – the last possible moment. Some racer was sitting there and saying something about going back. He'd been sitting there awhile; I hadn't seen him ahead of me in the last ten miles. The wind was howling so I couldn't make out what he was saying, other than blah blah blah I quit. He didn't hurt. He wasn't writhing in agony. He just looked tired. Maybe this was in his backyard. I have given friends the ‘just ride with me speech, just keep moving'. Not a total stranger, besides I had my own demons I was fighting. These races are opportunities to learn about oneself; they strip you down and expose your soul. I ‘ripped’ through Rim Rock remembering the fun from the day prior, ok maybe not ripped but it felt like it. I climbed up to the last aid station and I was filling bottles when Jeff saw me. I was so stoked to see him especially coming from such a dark place. We gave each other a hug, knew we had it, and agreed that today wasn't your everyday NUE race. I had easily made that aid station and we had two hours to finish. Seeing him sparked me to get through the last 14 miles. I rode the last bit taking care to see the surroundings while finally being able to mentally relax. I had been stressed for the last 4 hours. The start/finish arch had been taken down, because of the wind. I cruised up to the timer with a huge kiss of the ring and finished with a power slide. They were having the awards at that moment. I was happy to hear Cheryl took the win; I went to the van, saw my buddy Jeff and called my wife. I haven't been emotional finishing one of these since I finished my first, some five years ago, I'll admit it this time I shed a tear. I put a lot of work into this, and skated through on determination. Three months ago I was 195 pounds, I set two goals lose 20 pounds and finish the True Grit Epic. the 100-mile True Grit mountain bike race. The second story is of Jamon Whitehead, and accomplished singlespeed racer from Salt Lake City. One hundred yards into the race – that’s how long it took before I experienced my first mechanical issue. “It’s gonna be a long day” I thought to myself as I watched the field disappear into the red rock horizon less than a mile from the start. What was I doing riding 100 miles on a single speed fully rigid, 45 lb. bike with fenders, milk crate basket and rim brakes? …. Oh cause it’s awesome, that’s why. It all started last summer after riding 24 hours in the Sage in Gunnison Colorado in the solo single speed category for the 3rd time in three years. 24 hours in the Sage is the only 24-hour race with a solo “townie” category which allows them to regard it as the World Championship (why the hell not?). 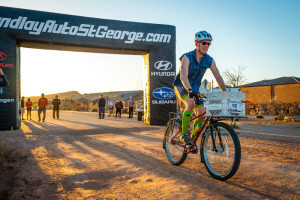 After 36 hours of consciousness, 220+ miles of single track, and a few rounds of beer pong (Beirut, if you swing that way), the thought of riding the race on 20 year old technology sounded pretty appealing. I guess the seed took root because 5 months later I found myself digging through parts bins, only requirement being nothing manufactured after I moved on from the 5th grade. After completing the project a week before True Grit I decided that the perfect way to trouble shoot the ride was 100 miles of arguably the most technical single track in Utah. Now here we are, race day on the first single track the bike has seen in its current configuration. The first thing I noticed (aside from the horrendous chain line) was the horribly steep 36X19 gear ratio, the second thing I noticed was how difficult it was to maneuver single track with 20 pounds sitting in front of the stem. The basket alone wasn’t heavy, it was more the pouch full of tools, Tupperware container full of snacks, two full bottles and a blue tooth dual speaker set up bangin’ a healthy dose of Salt n’ Peppa cranked to 11. I spent a combined 60 minutes during the first 10 miles with the bike upside down adjusting chain line, repairing flat tires and generally applying adjustments that I should have been applying the night before. This allowed the majority of the 50-mile field (who started an hour after I did) to catch up. By the time I finished the Zen trail section (mile 19) I had resigned to the fact that I was not going to make the 3pm cut off to start the second lap and the 100 mile course. The most fun I had all day was passing mid pack 50 mile racers who had slipped into granny gear while pedaling into the 35 MPH wind. Did I mention I was pushing that crate more than a mile through that wind? Good. That was my favorite part. I ended up making up time on the smooth Bearclaw Poppy/Stucki Springs section of the course and by the time I popped out on the Santa Clara trails (mile 35…ish) with about 100 minutes before the 3pm cut off, I felt like I had a reasonable shot to make the second lap. That was before the 3rd and 4th flat tire, neither of which I had replacements for…which led to about 15 minutes of hiking and half a bag of potato chips. By now the 100 mile ship had sailed so I pounded the 45 lb. obsolete machine back to the start finish for beer and an interview with the St George News. It was a great day in the saddle. The bike blew up before my legs did which allowed for another 3 hours of riding (and pruning) on Gooseberry Mesa the next day. Trouble shooting the townie was the mission and it was mission accomplished…oh and my sleeveless denim “jersey” spawned a new trend in southern UT riding gear. The last story will be short. It is of two brothers, Allan and Bret who came to race this event together. Taking on the True Grit 50 was not an easy endeavor, and from stories recalled by aid station volunteers and course marshals these two never left each other’s side, regardless of the pain and suffering. They managed to make all the check-points and rolled across the finish line at 6:39:52; the very last racers to finish that day. They spend over 9 ½ hours riding their bikes in the heat and wind. Now to finish the race, when you are the only racers left on course, and a skeleton crew around for support, and to give it all you got so you don’t miss the final cut-off of 7 pm… Well, that is True Grit! See results in this issue.